For 1 ½ months, 6 ambassadors will travel in 2 different routes all over Europe visiting many AEGEE locals and their cities. The 2 teams of 3 ambassadors each aim at spreading Europtimism, raising discussion on this year’s topic of civic education and exchanging ideas with people they meet on the way. To do so, they will participate in local events and continuously share their experiences through blogs, videos and photos on their website. In the end, they will provide a quantitative and qualitative data analysis with regard to the main objective of the project. 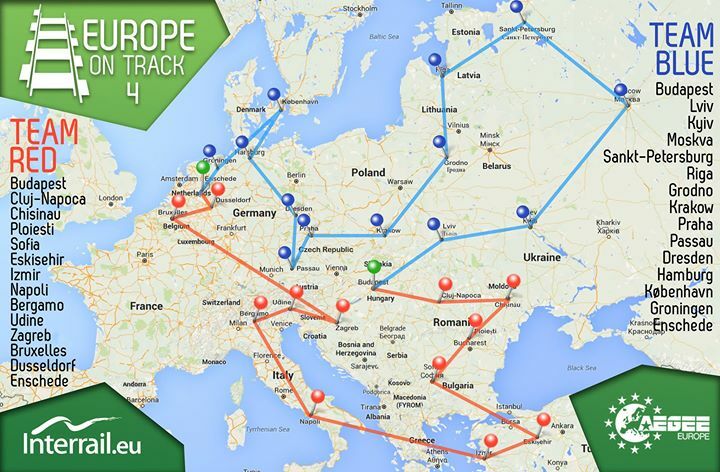 These are the routes that the two teams will travel in the upcoming weeks. Can you spot Dresden? 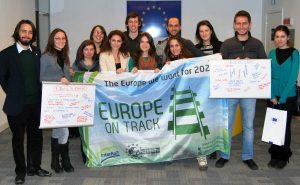 The 6 highly qualified ambassadors got chosen out of 300+ applications by the Project Team of Europe on Track. They are not necessarily AEGEE members as the responsibles wanted to open the project to everyone. We are especially proud to say that an AEGEE-Dresden member will be one of the ambassadors this year! Jorge Sánchez Hernández, founder and former president of AEGEE-Dresden, will travel the blue route and visit us in May. You can already meet all of the ambassadors here or at one of their stops! What does AEGEE-Dresden do as hosting local? As hosting local we are highly motivated to help the ambassadors to achieve their objectives. By organizing an event at our university, we want to give them the chance to inform local students and interested people about civic education, AEGEE and the European idea. More information on our event will follow soon! So stay tuned on our facebook page and our website. Don’t miss the chance to get to know the ambassadors, to learn about Europe and civic education, and to share your thoughts and ideas with them!